Beautiful turtles! Who doesn't love 'em? I think our local turtles here in northern NY are still sleeping in the mud. But any day now . . . . Thanks Jackie. Hopefully the waters will be warming this weekend and you'll see basking turtles in New York. I also grew up going to Seiberling with my grandparents. I can even remember the construction of the current "underground" nature center. The copperhead and the inside of the bee hive were always my favorites. I meant to say hi at the Reptile Conference last weekend, but never got a chance. Hey Jason- Sorry we missed each other. It was quite a nice conference, wasn't it? My memories pre-date the underground nature center. Back then, there was just a teeny tiny building not too far from the pond. I heard that the center was recently remodled again because the exhibits were too "old". I wonder if that copperhead exhibit is still around? I definitely remember it. I need to get back there again. This turtle is gorgeous. It really does look like someone painted his shell and body. Great Shot, Tom! 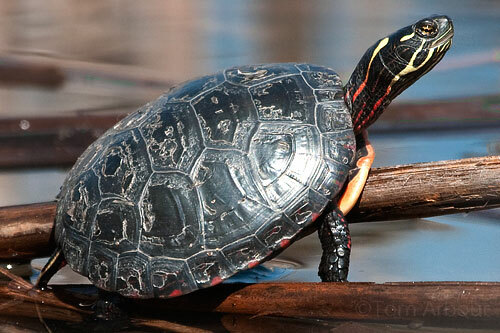 I posted turtles today, too :-) Always a sure sign of spring when the logs fill up with turtles!